View of the village of Kenmare and the River Tay in Scotland. 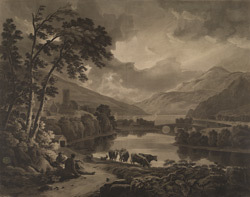 Kenmore is situated at the eastern end of Loch Tay on a short peninsula near the loch’s outflow. The village church stands at one end of the settlement and can be seen here to the left of the print. There has been a settlement in this area for hundreds of years however the original village was situated teo miles away and was known as Inchadney. When Balloch Castle (now Taymouth Castle) was built in the 16th century the village was moved. It was carefully planned and some of the ideas were very modern- for example cottages were even provided for local craftsmen so that their trade stayed in the area. The Kenmore Bridge can be seen in the middle of the print- the circular holes above the arches were for flood waters to pass through so that the structure of the bridge would not be damaged.